Click on SBuilders “Map” tool symbol, then click in the middle of your screen and select your “n35-36w006.bmp” file. Your map would first be be displayed quite distorted, or in an extremely small size, and SBuilder shows you the message “You may need to calibrate this bitmap!”. Click OK. 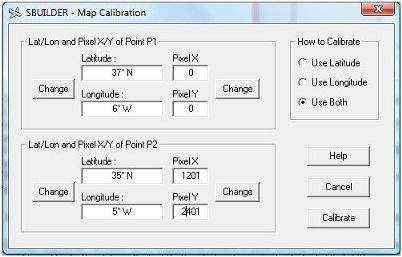 In the following window go to the “Mesh Map” tab and click the button “Calibrate Map”. You don't need to change the entries of this or the other tabs first. 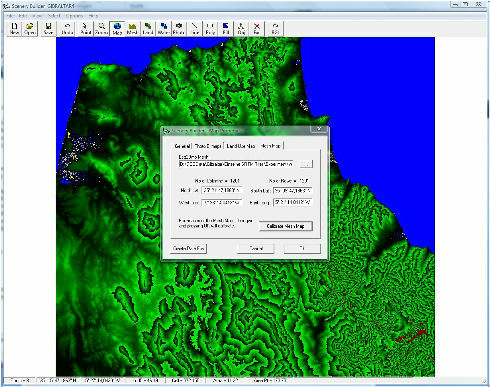 In the “Map Calibration” window, you supply the upper left / lower right corners of your BMP heightmap. As you see in the following picture, our "Gibraltar" map is higher than one tile (2401 pixels instead of 1201) due to the two merged bitmaps. Once you're done, click on the "Calibrate" button. After the window closed, you would see your map in the right place. 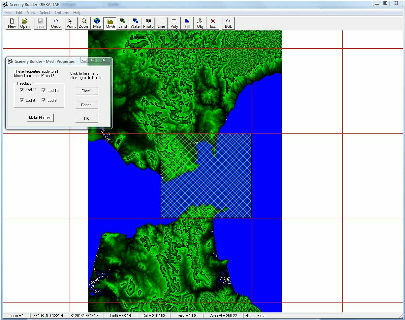 Rescale your map for a better overview (using the mousewheel), and show the LOD8 grid (pressing F8). Then choose SBuilders "Mesh" tool, and click into the tile(s) you want to create mesh for. In the Mesh Properties window, you may check all of the shown resolutions if you want. SBuilder will generate a separate BGL file for each selected Level of Detail. Then click OK.
SBuilder only compiles activated objects! So choose “Select  All Meshes” from the menu, then select SBuilders “BGL” tool form the toolbar (see the hint below for non-US systems!). Check the boxes as shown and click “Compile”. For a few seconds you can watch the process running in a separate Command Window (Microsofts FS9 SDK tools are mostly command line tools). You shall find your newly created DEM-files in the SBuilder\Scenery folder after the process. That's it – your mesh is done already! In case you’re outside the US, your Windows is likely to be set to some kind of Culture using “,” as decimal separator. This might result in a “Compilation Error” when using SBuilders BGL tool, due to the FS SDK tools that SBuilder uses. Iencountered it on my system, but it’s not necessarily the same on your system – just try. If you get the same error message, you have to change your International settings to “US” before compiling. If you do it more often, like I do, you can automate this process by creating REG files (small text files) looking like this ..... and double-clicking it. A second REG file changes the settings back to German (in my case) with a simple double-click after compiling.